Dharma congregation was gathered to celebrate the Buddha’s Birthday of Buddhist Era 2562, and to wish for a successful inter-Korean summit and permanent peace on the Korean Peninsula. 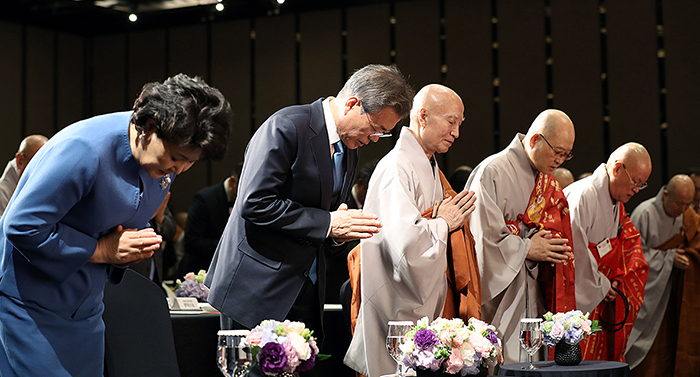 Association of Korean Buddhist Orders held “Dharma Assembly for Peace and Security on the Korean Peninsula” at Grand Intercontinental Seoul Parnas on April 17. Around 1,000 participants were present at the event, including ordained and lay leaders of Buddhist orders represented by President of the Association, Ven. Seoljeong, President Moon Jae-in and First Lady Kim Jung-sook to pray for compassion and wisdom of the Buddha to establish peace and security on the Korean Peninsula. “Dharma Assembly for Peace and Security on the Korean Peninsula” has been convened 18 times since 1981. This year’s ceremony focused on praying for a successful inter-Korean summit as the summit so significant historically to the future of Korean Peninsula has been scheduled to take place a month before the Buddha’s Birthday.